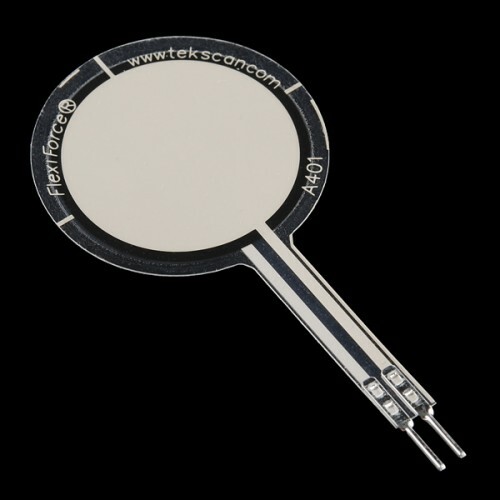 This is a piezoresistive force sensor from Tekscan. The harder you press, the lower the sensor's resistance. Pressing hard, the resistance changes from infinite to ~50k. The sensor itself is thin and flexible, but the resistance does not change while being flexed. Resistance changes only when pressure is applied to the round area at the end of the sensor. Used as a presence sensor (someone standing), weight sensor, pressure sensor (impact testing), etc. The overall length is about 2.25". The sensor comes with a 0.1" spaced, reinforced, breadboard friendly connector. This sensor ranges from 0 to 25lbs of pressure.